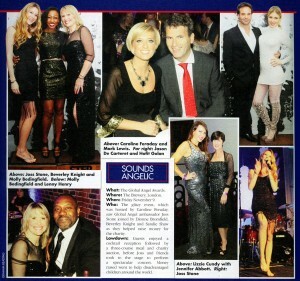 It was great to see the Global Angels Awards in the media again this year. We are especially grateful to Hello! and OK! for writing such wonderful articles. Hello! featured us in their November 26th issue with Global Angel Ambassador, Joss Stone as well as Beverley Knight and Sandy Shaw taking the spotlight. It’s a brilliant piece that really demonstrates the highlights of the evening as well as the motivation behind it all, recognising the generosity that has made our work possible. Last week we were also in OK! in their Society Diary with Mark Moody. We would like to thank Graham Reading for his photography that really captured the evening. The piece highlights some of the incredible guests who joined us on the night including stunning pictures of our Ambassadors Lizzie Cundy, Hofit Golan and Caroline Feraday, and special guests Lenny Henry and Jason De Cateret.